Ali Modu Sheriff is not mending fences. He just wants to be left alone. On Wednesday, the Supreme Court's judgment sacked Sheriff leadership team and recognized Makarfi as National Chairman of the PDP. Few hours after the apex court ruling, reports in the traditional media and social media platforms had indicated that Sheriff had on his Twitter Handle congratulated Makarfi, pledging to work with him in the interest of the party. However, the former Borno State Governor on Friday dissociated himself from the report, describing it as fake. In a statement signed by his spokesperson, Bernard Mikko, Sheriff denied saying "congratulations". “Our attention has been drawn to a fake congratulatory message credited to an imaginary Twitter Handle of Senator Ali Modu Sheriff, the immediate past PDP National Chairman. “For the avoidance of doubt, Senator Ali Modu Sheriff does not have or own a Twitter account and could not have tweeted any message. We therefore view the said message as fake and mischievous and should be discountenanced as that of evil doers. 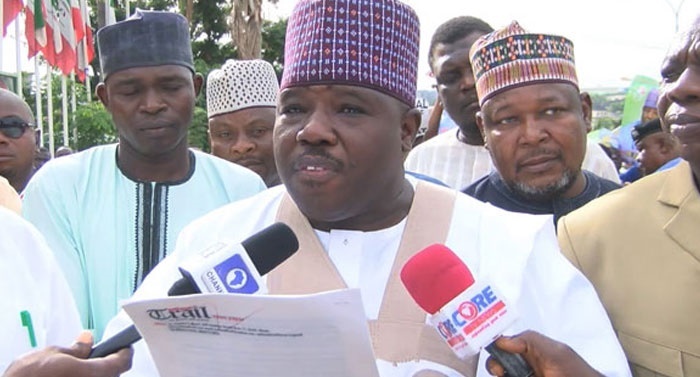 “We further warn all mischief makers to desist from trying to exploit the huge political capital of Senator Ali Modu Sheriff for selfish gains,” the statement reads.